Festivities run through the blood of every Filipino. It is in their minds and hearts. It is both a meeting dimension of their spiritual and social lives. For Filipinos, without a festivity, life is not worth living or dying for! Religious celebrations, town anniversaries, commemorations, and other social events that involved cultural, political as well as religious dimensions abound in the Filipino culture. Among the three dimensions, religious festivities are the most popular ones – we call it fiesta (or pista). Fiesta is an indelible mark in the heart and soul of every Filipino. It is embedded unconsciously in every corner of their activities and every future plan. And they do it through good times and bad times. Fiesta must go on whatever the situation is. A religious fiesta celebration usually runs from two days, a week or a month-long festivity. It is mostly attributed to celebrating a saint’s feast day as patron of a barrio, town or city. Aside from such religious festivity, there is also one festivity that celebrates a town’s harvest season thanking nature for its abundance. It is the aim of this page to introduce you to some of the biggest festivals being celebrated annually and without fail in the Province of Cebu. Cebu, being the first area and seat of Christianity (and Catholicism in particular), has its every town and barrios hold colorful and vibrant festivities. In fact, you can enjoy it all year round by visiting every place whenever they are celebrated. One of the best things in such festivities is that you are always welcome to anybody’s house that prepares food to offer freely to any visitor – a relative or outsider. Welcoming a total stranger and being offered food and drinks is an act highly valued by Filipinos. A family is happy to do so since they believe they will get more in return when they share their blessings and abundance. What influences and why Filipinos celebrate a lot? We will try some obvious reasons to the festive activities being observed by people in different corners of the province and the country. First, the sense of religiosity and inner connection to the divine being give the Cebuanos (and Filipinos) the spirit and energy to perform and celebrate. They seem to allow that spiritual power to guide them and make them do such revelry and religious activities. They sometimes make something out of nothing just to be able to get organized and perform the festivities. Secondly, Filipinos in general love to socialize and to be in harmony with everyone else. They value friendship so much more than anything. They tend to be friendly with everybody and celebrating festivals is one way of expressing that inner feeling which is not usually expressed openly in their daily lives. It is also that sense of community that brings them together to organize festivals. During feast days, families who are prepared to provide food and drinks to its close family members, relatives and people belonging to their family circle would organize and invite people. It expresses that sense of family-togetherness which is highly valued and the first one in this culture. Another reason is that some people want to show off their influence and authority. This could also mean repayment and offering them something in return for their services and whatever favor or support they have offered. So, the organizer of this festivity would invite in his (her) great house some high-ranking officials and people with high stature in the community. Finally, Cebuanos (and Filipinos in general) use and celebrate festivals to enjoy life and forget hardships. Living one day at a time and worry only today is a common concept and practice among many. That is why some people, although they are experiencing some financial difficulties, they spend and use what they got for the festivity. This may sound very weird and illogical thinking among outsiders but sensible enough among Filipinos who seem to understand the meaning and value of such action. Among many religious festivals in Cebu Province, Sinulog is the biggest one which is usually joined and celebrated by people coming from outside the province and foreign tourists. 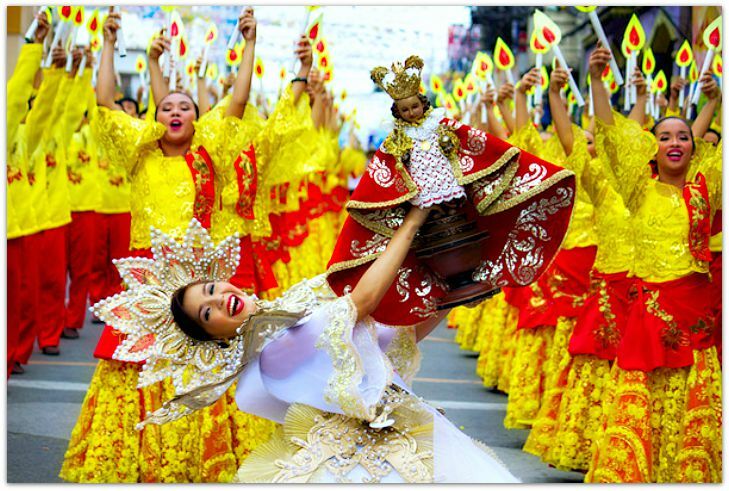 Sinulog is a celebration to honor and pray to the Child Jesus or Santo Nino in Cebu whose image is thought to have been brought by Spanish explorers in the 16th century to the province. Sinulog is celebrated mainly through colorful fluvial parades, vibrant street dancing which are mostly supported by the local government by encouraging contenders to join the merrymaking as a competitive activity. Street dancing with religious tones is the most exciting part of the festivity. As much as it is a form of religious festivity, it is also a highly competitive endeavor. School and various organizations prepare dance steps and formation through tedious months of preparation and practice. The participants, mostly younger students, perform the frenzy and revelry dance steps while at the same time chanting the religious mantra “Pit Senyor” (an entreaty to the Child Jesus). The following are some of the popular religious and social festivities being celebrated in Cebu Province. Certainly, there are still hundreds of festivals being held annually in the province. However, they are not (yet) specifically mentioned here probably because they are not so popular or that they are celebrated at the same time and season, thus being diluted by the more popular one. Some of the festivals aforementioned are not necessarily directed to a patron saint or anything related to religious figures. They can be a thanksgiving festivity for the great harvest of crops, sources of food and or particular way of livelihood that specifically sustains the community. For example, on Camotes Islands a festivity is being held annually to celebrate the islands most popular root crops that support the islanders as part of their staple food – kamote (sweet potato) and cassava. However, while they celebrate that particular day they also attribute that giftedness to the Creator of nature and the world. Basically, that is because of the religious background as influenced by Christianity on the island. Thanks for reading through the end. Have an interesting and exciting fiesta!